I’ve been away from this blog for a number of months. It’s been a Spring that has left me at a loss for words. In fact, “loss” has been something I was forced to confront on a number of levels. The most heartbreaking was the death in late March of my older brother Dave, a vibrant 55-year old Lutheran pastor who was taken very suddenly by an aortic aneurysm. It’s hard to explain how devastating this has been to the entire Smith family. He was deeply loved. If you’ve been following this blog, you might remember that about a year ago, I posted some pictures of my preliminary work in making a worship stole for Dave based on the season of Pentecost. It was some woven shibori work I decided to tackle. I finished the stole last Fall, but Dave was between calls, meaning he was not serving a permanent congregation at the time. He was an interim for a short time and he wanted to wait to receive it when he found a new church home. I kept the stole in my drawer waiting for that day. It never came. When he died, we placed it near him at the visitation; then the Bishop brought it up to the altar during her funeral sermon. That was in April. When we neared Pentecost, I decided it would be a shame for the stole to go unused. 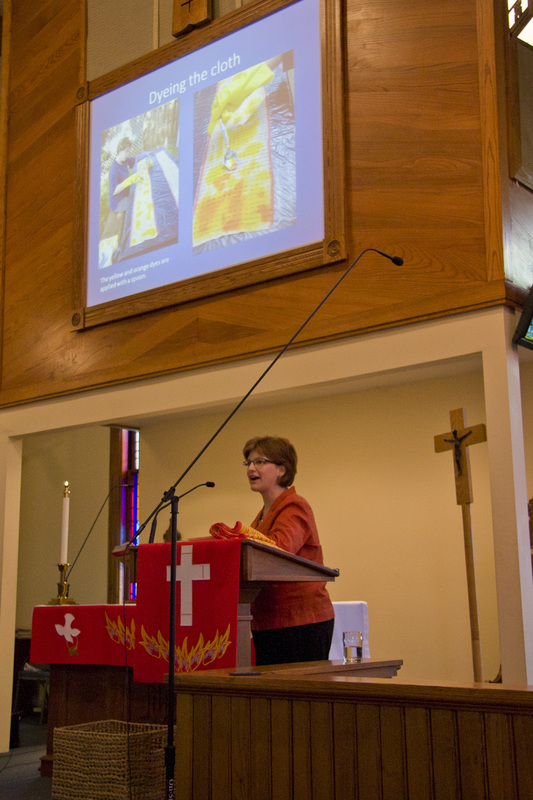 I called the church he served for most of his ministry and last Sunday we dedicated it to St. Paul, Sharon Center, Oh. I presented a powerpoint of slides similar to those in last year’s blog post. 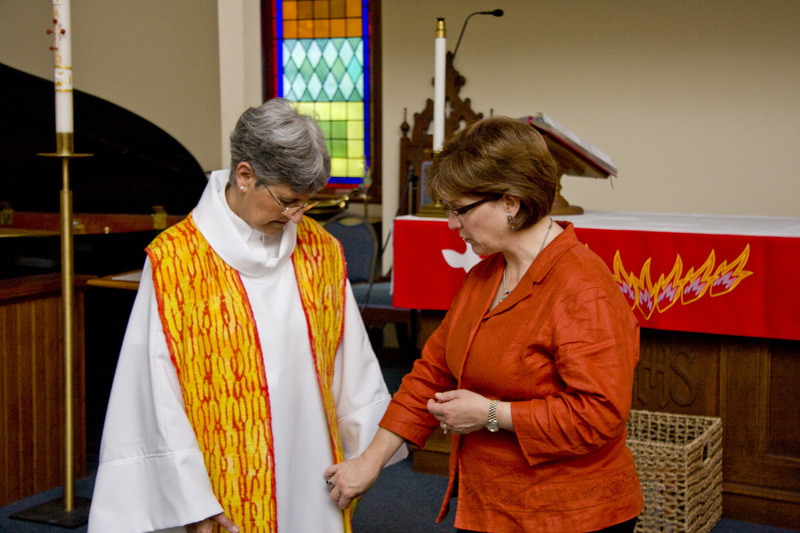 Pastor Judy McGuire took off her own stole and put on Dave’s. Then we said a prayer and wiped away some tears. It was a wonderful tribute on a beautiful June Day.